I found a spice mix called Ras el Hanout. It’s a Moroccan mix that has cinnamon, turmeric, red chili flakes, coriander, ginger, anise, allspice, paprika flakes, long pepper, cumin, nutmeg, white pepper, caraway, nigella seeds, cardamom, mace, galangal, fenugreek, red rose petals, cloves, spearmint leaves, lavender flowers, grains of paradise. I was immediately intrigued. The first dish I made with it was a chicken bake with root vegetables and it was delicious. The warmth and fragrance of this mix adds great flavour and complexity to your dish. I knew it would be great in a stew and I was right. Now that winter has come with a vengeance, all I want is good hearty meals that warm my bones and keep my tummy happy for hours. This stew does just that. In a large pot or dutch oven on medium heat, sauté the onions, carrots, fennel, and garlic in the grapeseed oil. Once the vegetables have softened, add the ras el hanout and stir until the vegetables are coated with the spice. Add the tomatoes and stir, then add the chicken stock. Once the stew starts to bubble, add the meat, chickpeas and salt. Stir well. Reduce heat to low and let simmer for 20 minutes. Meanwhile, chop the swiss chard. After 20 minutes, add the swiss chard. Stir until the chard wilts. Let simmer to 10 more minutes. I wanted this stew to be really chunky with very little liquid. If you want it to be more soup like, double the tomatoes and chicken stock. If you want it a little more thinner, double the chicken stock. I don’t care for greens. There are people out there who can steam them or eat them as a salad and think they’re delicious, I am not one of those people. So whenever I make a stew or chili, I always add a bunch of greens into it. 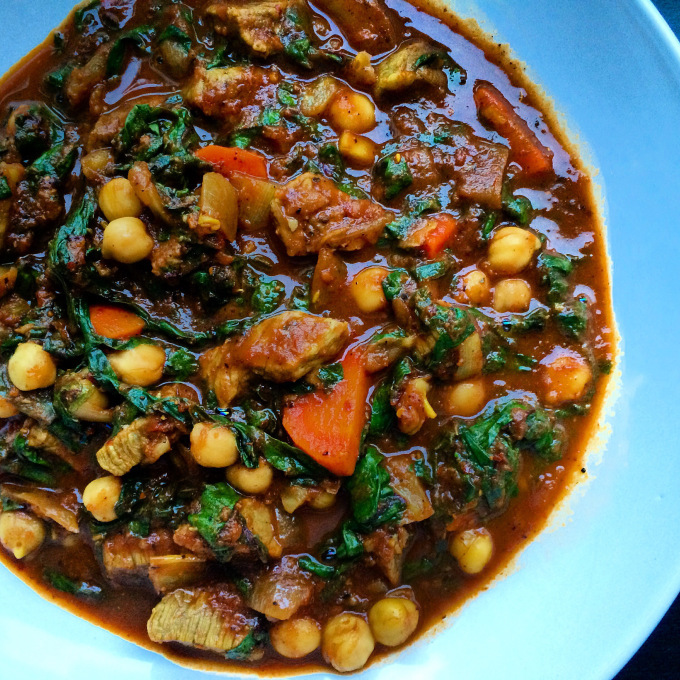 This adds more nutrition to this already healthy stew and colour. And I eat my greens without tasting them. I always freeze half of the stew so I have meals for another time. If refrigerating, you can keep it in the fridge for about a week. I use the President’s Choice Black Label spices. It would be a pain to have to go around searching for all 24 spices in this mix. They’re reasonably priced and a pretty good deal if you get them on sale.